Safe to say that I am not in the exact target demographic for Music for Viola and Electronics II, but at the same time I find myself more engaged than I thought I would be. This set of five improvisations mix Michel Banabila’s popping, gurgling, noisy electronics with the rasp and soar of viola and violin from van Geel, along with several guest musicians. Together they maneuver speedily through spaces that are gratingly experimental one moment but almost pleasingly normal, for lack of a better word, the next. There is a fair amount of tension and release, vivacious energy and pause-for-breath breaks. 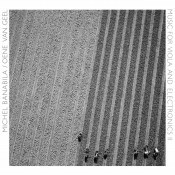 There are spots where I am inclined to move along, feeling like I’m hitting the boundaries of my tolerance for neoclassical jangle, but even at its most demanding, the way this album showcases the chemistry between Banabila and van Geel holds me in place. The jagged, spliced tones of “Kino Mirko” begin to get on my nerves a few minutes in, tired of my brain being picked at my pizzicato notes and sharply truncated moments—not to mention some genuinely annoying trumpet braying from Eric Vloeimans—but it slowly resolves itself into a whispery, textured drone. “Chaos” lives up to its title shortly after luring you in with quiet strings from van Geel. Banabila gets aggressive with the noise, and van Geel counters with squealing string runs and dissonant draws. Again, while it can be off-putting, it is saved by an intriguing dynamic that shoots it from those hyped-up moments to passages heavy on pause and tiny sounds. The best, most accessible piece here (for me) is “Vleugels,” and I can’t get enough of it. It enters on string spirals, with Emile Visser’s cello arriving to add his repeating notes to van Geel’s as they build into a charming minimalist space. When Visser takes the lead, the mood shifts, the sound gets richer, and the sense of moving toward something is strong. Enter Joost Kroon’s drums, absolutely launching the piece with a blast of pure rock energy. The strings head straight for your heart at this stage; it’s truly that stirring. Aside from “Vleugels,” it does take some tolerance for experimental music to appreciate Music for Viola and Electronics II. It challenges the listener, but the complexity of sound and the chemistry at work tempers the rougher edges.